Webometrics is an invention of Cybermetrics Lab, a research group belonging to CSIC, the largest public research organization in Spain (You can learn more about CSIC on this Wikipedia Page). CSIC is attached to the ministry of education in Spain. Webometrics university and college rankings are based on a research that focuses on Technologies, computer science, social sciences and humanities. It uses link analysis for quality evaluation. What we picked from them is that Web traffic, Scholarly Citations and page level matters in their rankings. Rankings of Universities and Colleges in Kenya might appear to be a good thing because it attracts competition which in the long run improves quality. But to say the least, the rankings are very flawed. They focus on Quantity! Quantity! and Quantity! The more citations, the more traffic, the more social influence the better the rankings. To have a more realistic view of a college or university, you need to look at the quality of the publications, quality of course material, tutors, entry value and environment of learning. 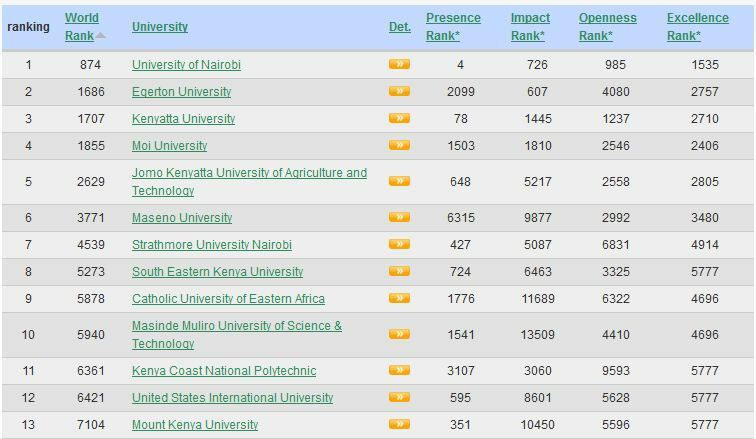 Do not miss all our latest updates on ranking of universities and colleges in Kenya.